This autumn season has truly had one of the longest sustained periods of vivid fall color in memory. There are still a few trees with color left in them, but most of the leaves have fallen after a period of autumn colors lasting for well over a month. I had some time to spare and took the chance to check out one of the last areas of McConnells Mill State Park that I have not explored, Grindstone Run's Grindstone Falls. At roughly 20 feet, and relatively low flow, these are definitely not the most spectacular falls in the area, especially when compared to the nearby Hell's Hollow Falls and the other falls and rapids of the Slippery Rock Creek Gorge in McConnells Mill State Park. Grindstone Falls is roughly 3 miles south of the mill. 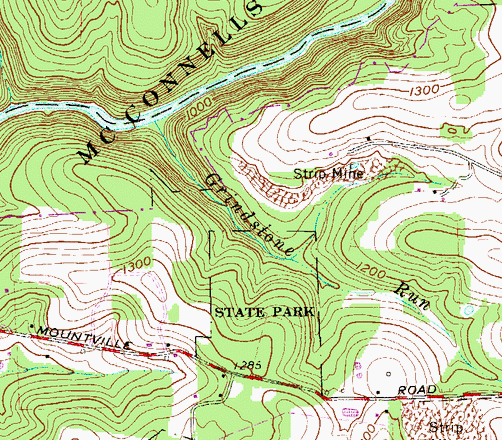 Acid mine drainage has been identified as a continual problem along Grindstone Run, a direct tributary of the Slippery Rock Creek. Back to the sideview. The gorge is pretty large, with a pretty rapid descent. A series of small waterfalls/cascades continues down the gorge to Slippery Rock Creek.